One thing I miss - a little - about daily journalism is the competition and the sneakiness involved in trying to get the scoop, or in this case, the picture no one else is going to get. I say I miss it a little, because I understand that being sneaky can bring out the worst in all of us - so I try to avoid it. But in the spirit of competition with yourself and others - it’s fun. Back in January I was in New Hampshire to cover the first presidential campaign stop there by U.S. Senator Elizabeth Warren(in red above). I could tell by the movements of the staff that the plan was to bring Warren into the building through a back door and behind this black curtain. A crowd of several hundred people was waiting for her on the other side of the curtain and had no idea when she would enter, or where she would enter from. I noticed that there was a about a one foot gap between the curtain and the side wall and it was unguarded. No one on staff was paying attention to it and neither were any of the other photographers. The ol’ sneaky gene was re-awakened in me. I positioned myself about ten feet away, acted as if I was bored by the whole event, tried to get a light reading from a distance, and waited for Warren and her entourage to arrive. When I saw movement behind the curtain, I casually scurried over (yes, you can scurry casually) popped myself through the curtain and got off several shots. Within 30 seconds two other photographers pushed beside me to try to get the same shot, before we were all shoo-ed away. What I got wasn’t great. It was under-exposed, but it was slightly different than the staged photos that came out of the rest of the event. 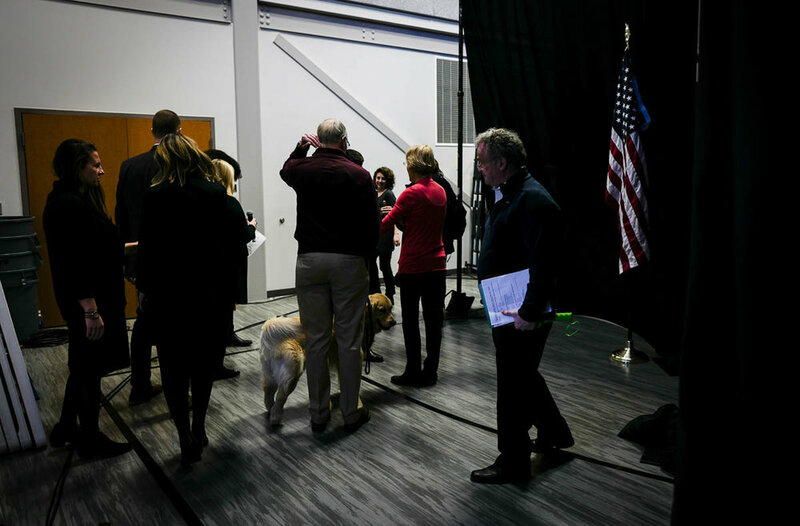 The shot does reveal a bit of the stage craft that goes into political theater and how many people it takes to move a senator, her husband and their dog. The American flag behind the stage is there for “grip and grin” shots with supporters. The aide with the clip board is holding the line by line for the whole event.